What are 'Bath Salts' and What Do They Do to Your Brain? I know you've probably already read a few articles about the deceptively named drugs called "bath salts" and their effects (or alleged effects, i.e. zombie cannibalism), so in this one we're going to get right to the point. Bath salts are dangerous for chiefly two reasons, and neither have anything to do with addiction or hallucinations. The first reason is dosage, and the second is sleep deprivation. Before addressing each of those in more detail, let's quickly go over what bath salts are and are not, and how they affect the brain. First, the name "bath salts" doesn't refer to any single drug, but rather a group of substances with similar chemical properties. Most varieties contain either mephedrone or methylenedioxypyrovalerone (MDPV). Both drugs are related to khat, an organic stimulant found in the Middle East and East African countries. Khat is illegal in the US because it contains cathinone, a Schedule 1 controlled substance according to the DEA. Neither of these drugs are new; mephedrone has been bouncing around laboratories since the 1920s, MDPV since the late 1960s. Recreational use of the drugs is relatively new, dating back just a decade or so. Mephedrone is a stimulant and MDPV is both a stimulant and psychoactive drug. The qualifier "psychoactive" means that the drug crosses the blood-brain barrier and causes changes in neurochemical function, resulting in amplifying effects on mood, thought, perception and behavior. Neither of these drugs are hallucinogens like LSD. Hallucinogens are psychoactive drugs, but not all psychoactive drugs are hallucinogens -- the primary difference being that hallucinogens induce changes in perception that are significantly different than normal consciousness, not merely an amplification of conscious states we already experience. So, for example, someone who takes MDPV may find himself feeling extremely paranoid and panicky, but he's unlikely to believe that a giant lizard wearing a tuxedo is about to eat his cat. The comparison between bath salts and ecstasy (MDMA) is based on the results of a study on rats showing that MDMA and mephedrone have similar effects on the neurotransmitters dopamine and seratonin. The study also suggests that the long-term effects of mephedrone are less harmful than ecstasy, because the drug doesn't seem to deplete serotonin as severely as the favorite drug of rave goers worldwide. But, and this is a big but, these are the results of one study on rats, and the researchers were careful to point out that much more research needs to be done before we can draw any conclusions about long-term effects. Are bath salts addictive? Yes, they probably are, and for roughly the same reason that ecstasy is addictive -- they cause the brain to limit reuptake of dopamine, which means more of the neurochemical is available in the brain and the brain really likes that. Over time the effect diminishes and more of the drug is required to keep the ball rolling. 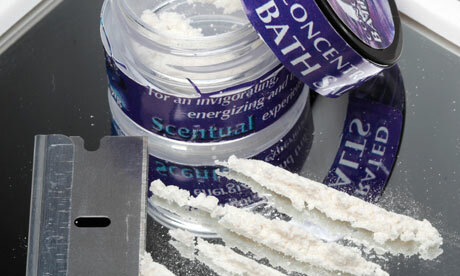 Are bath salts addictive the way cocaine is addictive? No, probably not. The reason is that cocaine is an exceptionally addictive substance that appears to hook the brain in more than one way. While it produces the dopamine effect described above, it also has the potential of profoundly altering the body's circadian rhythms in such a way that not having the drug is physically devastating. In addition, cocaine's dopamine effect is much more intense than that of bath salts, or ecstasy for that matter. You could say that the bath salt effect is like stepping into a shower. The cocaine effect is more like stepping under a waterfall. So if bath salts are potentially addictive, albeit not as addictive as cocaine, why am I saying that addiction is not the main problem? That question brings us back to the two main reasons bath salts are dangerous. First: recommended dosage. There isn't any. All a buyer knows is that they've paid $50 for a pouch of crystallized powder. At first they use a little and experience a bit of a boost, then a little more to keep the boost going, and so forth until their pouch of Ivory Wave is empty. When you read the testimonials of people who have used bath salts and experienced horrible effects, it's clear that most ingested all of the bath salts either in one sitting or over a short span of time. When your brain is hit with that much psychoactive stimulant, the nervous system overloads and all of the brain's hardwired threat alarms go off. The predictable result is paranoia, panic attacks, mood swings and reckless behavior. Plus, another effect called hyperthermia kicks in, which means that your body is overheating because it can't dissipate heat quickly enough to keep you cooled down. When you add all of those effects together, you get the "dark hell" many people describe after their first, and often their last, experience with the drugs. You also get the second main reason bath salts are dangerous -- when your brain is going through the ceiling, you can't sleep. One of the things bath salt users commonly report is that they tried taking a sedative, like Xanax, to counter the effects of the drugs so they could fall asleep, but it didn't work. This is the equivalent of trying to stop a freight train barreling down the track at 150 mph with a Toyota. Or even ten Toyotas. Once your nervous system has gone loco, and there's still a lot of the stimulant in your system to keep the train moving, low dose sedatives aren't going to stop it. When the brain can't sleep, nothing good will result. Sleep deprivation effects range from depression to psychosis depending on length of time. At the very least, not sleeping results in elevated stress hormone levels, presumably because the brain is reacting to perceived danger. This effect compounds the nervous system effects the drugs are already busily catalyzing. With enough of the substance coursing through someone's body, and several nights of not sleeping, could you end up with someone gnawing off another person's face? Possibly, yes -- but (another big 'but') since we are talking about psychoactive substances that amplify thought and behavior, it's quite likely that the face eater was already flirting with some dangerous tendencies before ingesting the drug. Thousands, perhaps millions, of people have used bath salts without becoming cannibals. But of course it's the outlier cases that get the ink. Does that mean that using bath salts is a good idea? Emphatically - No. Precious little is known about what these drugs do to the brain over time, and all signs so far suggest that it's probably not good. Even in the short term, placing so much stress on your nervous system and body is just not a good idea. It's like red lining your car for miles and hoping the engine doesn't explode. And if you happen to have a heart condition, particularly one you don't even know about, ingesting a pouch of bath salts could trigger a tragic outcome. Aside from that, bath salts contain a bevy of harsh chemicals in addition to the psychoactive substances -- like lidocaine, a topical analgesic and anti-itch agent. Why is it in some varieties of bath salts? Who knows, but it along with a lot of other stuff that hasn't even been identified yet is getting circulated throughout your body when you ingest the powder. Think of it this way -- would you knowingly snort a line of athletes foot powder? The best policy, even if you happen to live in a place where it's still legal to buy the drugs, is to avoid them. You won't be doing your brain any favors if you don't. For information on drug treatment options in your area, go to http://www.drugtreatment.com. Posted on June 13, 2012 by David DiSalvo.